Are you looking for Bergamot Bay Scentsy products online? 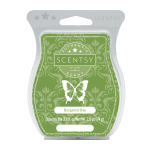 Enjoy the signature scent of our Bergamot Bay Scentsy bar refill. Our Bergamot Bay Scentsy products are like a walk in the fresh outdoors. Classic bergamot is captured beautifully in this eye-opening scent. Accented by crisp notes of juniper berry, bay leaf and white sandalwood, this fragrance will be your seasonal favorite. Bring back the crisp fall season with our Bergamot Bay Scentsy bar refill. Our Scentsy bar refills are a high quality, soft candle wax. When used with our Scentsy electric candle warmers, you’ll enjoy the best quality and longest lasting home fragrance in the industry. Simply break off a piece of the scored Scentsy wax and add it to your favorite Scentsy Warmer dish. Our non-aerosol Scentsy Bergamot Bay Room Spray has 2.7 fl. oz. of exquisite fragrance, and approximately 300 sprays in each bottle. Instantly freshen any space with our signature scent of Bergamot Bay Room Spray. Our Scentsy Room Sprays are available in over 80 enticing fragrances that will transform your environment. With just 2 sprays, you’ll deliver a burst of fragrance for up to 4 hours. 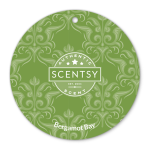 Perfect for the car, lockers, gym bags, linen closets and other nooks and crannies, our Scentsy Bergamot Bay Scent Circle might be just what you need for quick, on the go fragrance.